The pilot circled the pond we’d chosen to land in as a pair of Tundra swans lifted off its surface. The wind was favorable and we lined up for our final approach. 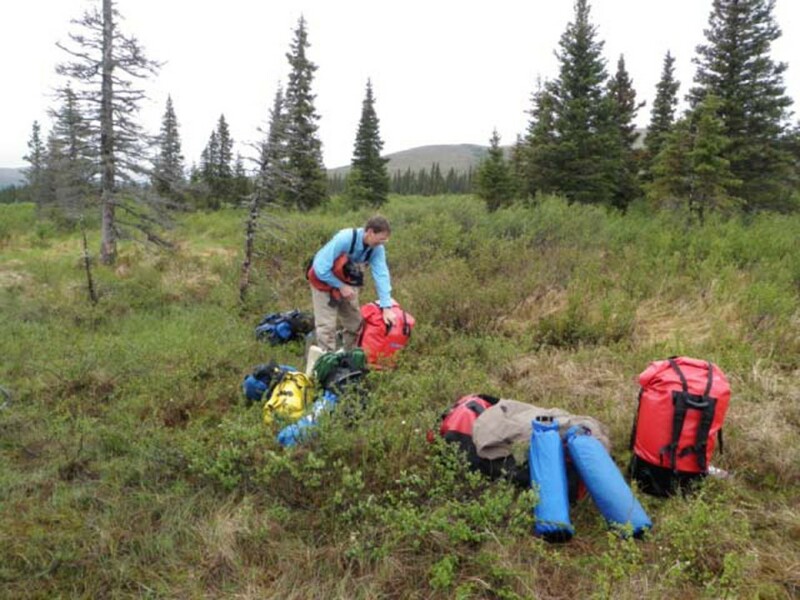 Both Robert and I used the last few seconds airborne to scout our portage across the sphagnum bog to the small tannin stained stream. It will surprise no one that this type of travel demands a minimalist approach. 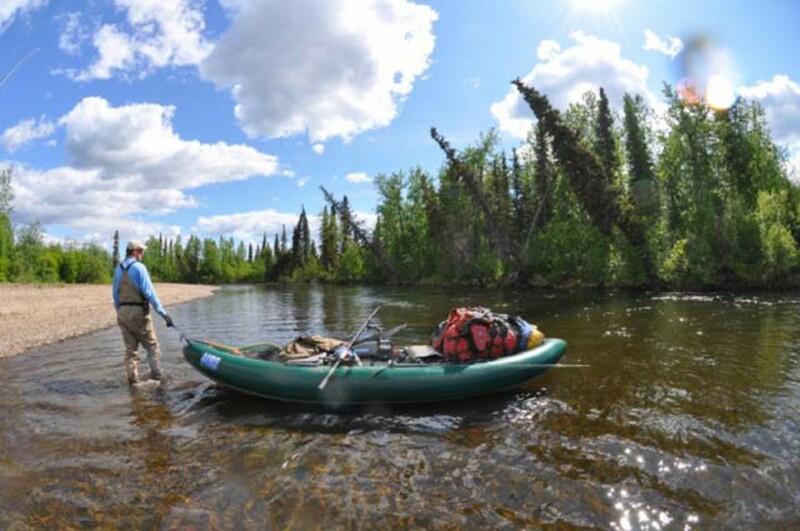 2 anglers, an Aire Traveler raft with rowing frame, a very light camp, a couple fly rods, and if we are still under the 650 payload of a Cessna 185 then we might have room for beer. We set up the raft and our fly rods. It was a showery and cool day in a week of showers and the water temperature was in the mid 40’s. June weather in this region is “Bipolar” flipping back toward winter and then fast forward to warm summer. Several grayling and 2 rainbows were caught as we threw leeches into woody cover. Pretty tough fishing. We couldn’t wade for more than a few minutes before we lost contact with our feet from numbness. We covered about 6 miles of water and worked hard for a few fish. 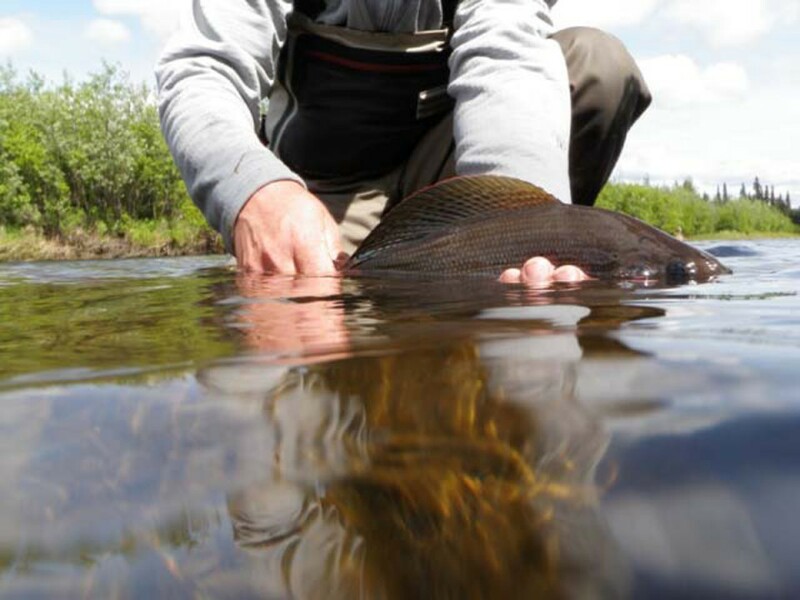 Mainly through dogged persistence, Robert landed a spectacular grayling of about 20 inches on a size 16 copper john. The fish simply were not moving to the fly. And when they did take a fly it was only dead drifted nymphs. 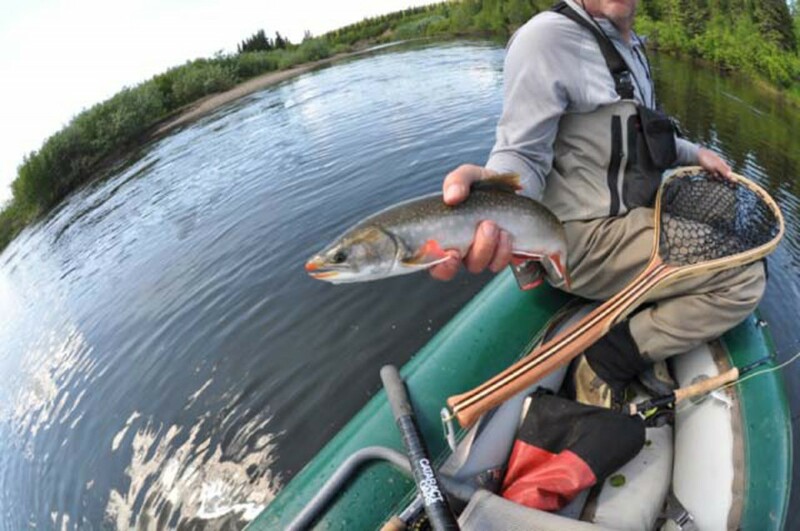 A rainbow of about 22 inches was taken on a leech. Tough conditions but Robert was up to it. 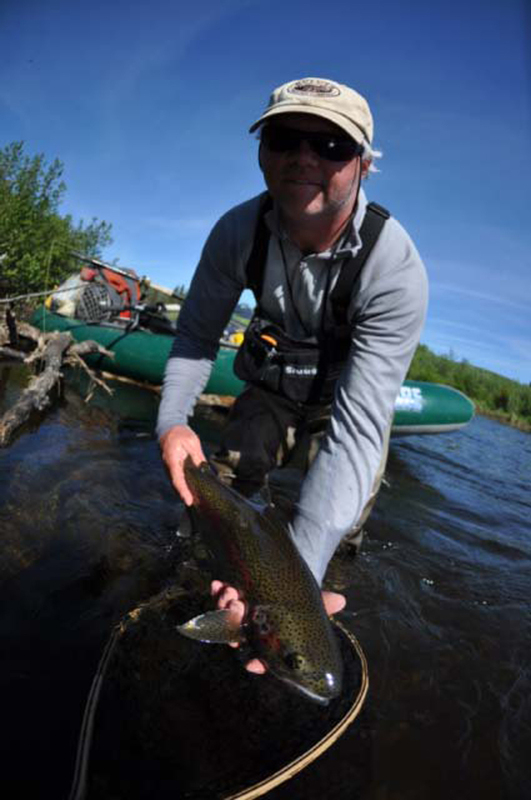 My experience with early trips hunting rainbows is that the conditions favor more highly the experienced angler and less so, entry level anglers. All the shoreline birds sang all night long. Thrushes and Juncos. Waxwings and Warblers. 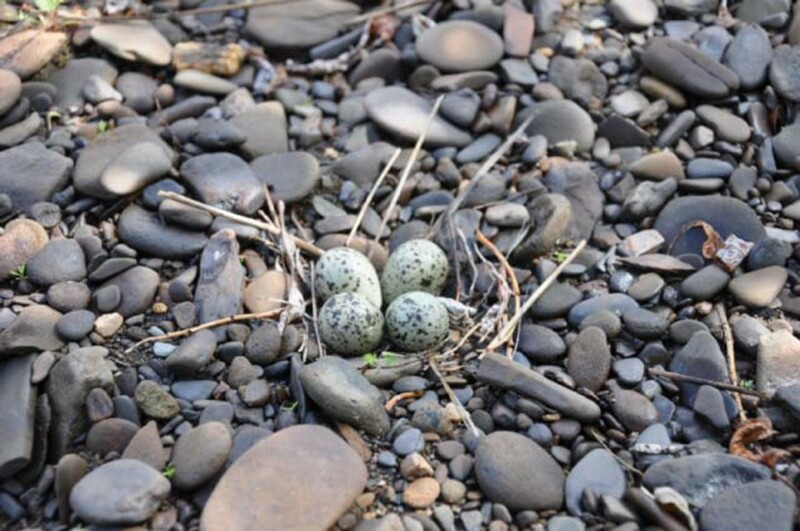 A semipalmated Plover nested on our camp site bar with 4 camouflaged eggs. Tracks of moose and wolf are quite fresh in the sand. Day three; the weather changed from cold and foggy to shirtsleeve, bluebird sky and the water temperature came up hourly. By dinner time the air temps were hot. 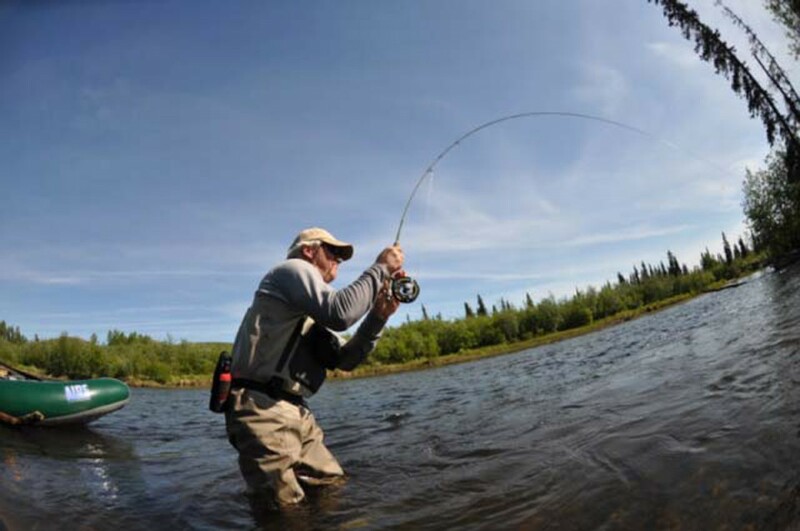 The stream fished beautifully as the water warmed and we traded rowing for casting while we fished 8 miles of taiga meanders. The rainbows were in very heavy cover, right under logs and in the brush. Lots of flies were lost. 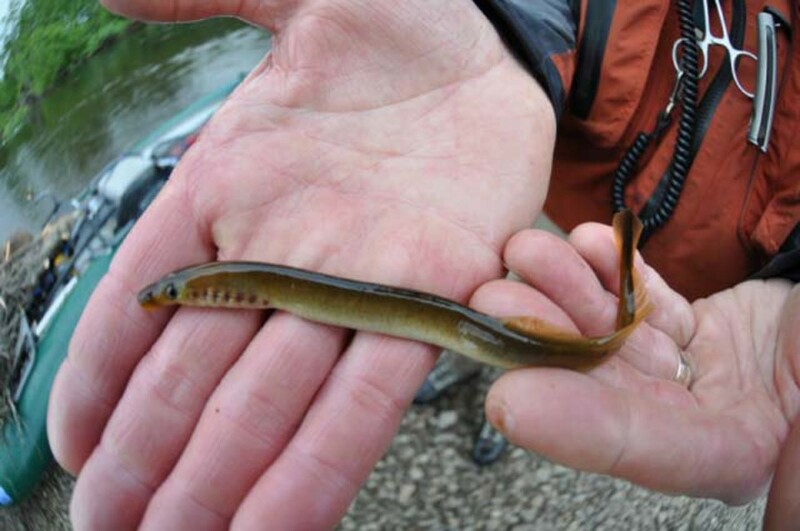 Dredging patterns tied of bunny fur that imitated Arctic Lamprey and immature grayling. It was like fishing for snook in the mangroves. I would give a lot to cast as well as Robert Sanford. His hand eye coordination is a gift. Some dozens of trout hooked and Robert lost one really large trout. Not insignificant. A really large “old Growth Trout”. 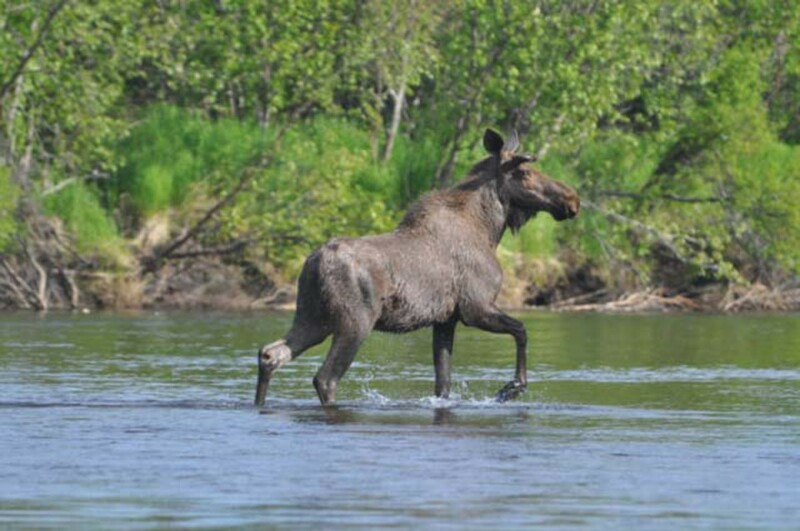 We witnessed one of the more curious wildlife behaviors that I’ve ever seen in Alaska. It was the daily movement of a pair of Tundra swans trading up and down that taiga valley with a White Fronted Goose in the formation. For three days the Swan pair was in sight and always with the goose within inches or feet of the adult swans. There are plenty of White Fronted geese in the region and there are scads of swans but why did this goose fly in the Swan family flock day after day as if it was a juvenile Swan. The scientific literature regarding Tundra Swans is full of reports of Swans being aggressive toward Greater white-fronted Geese. My best guess is that the goose was adopted as a juvenile last summer. In any case there was something compelling between the species! There is a large pool, perhaps 2 acres which recirculates in a counter-clockwise fashion where a tributary creek enters on river right. We took our lunch ashore there and sat in the sun. The surface of the pool, every so often, erupted as predatory Char pushed smolt, or more properly fry- at this stage, upwards to the surface while Arctic Terns pounced from above. After lunch we had some fine moments throwing Thunder Creek and other smolt patterns. 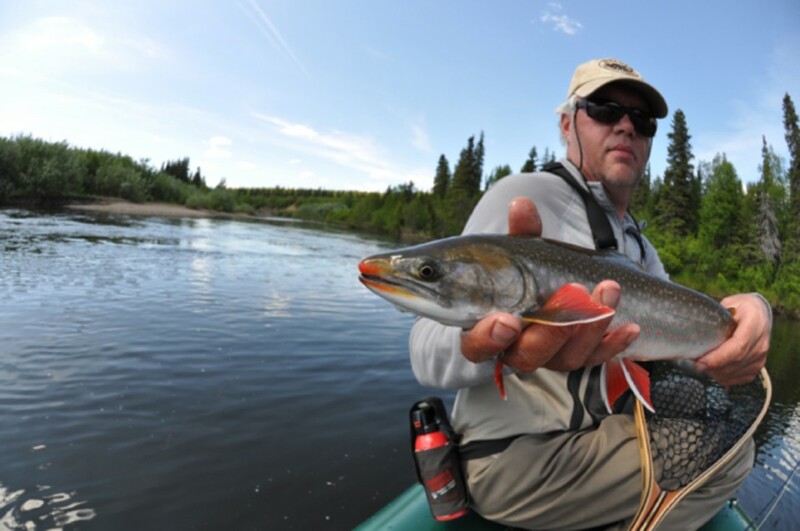 What the Char images show so well is the “compromised” state of health of adult Dolly Varden which migrated into the Upper Nushagak system last August and spawned in October. Depleted from spawning they over wintered and are still trying to recover by feeding on smolt before returning to the estuary for the summer. 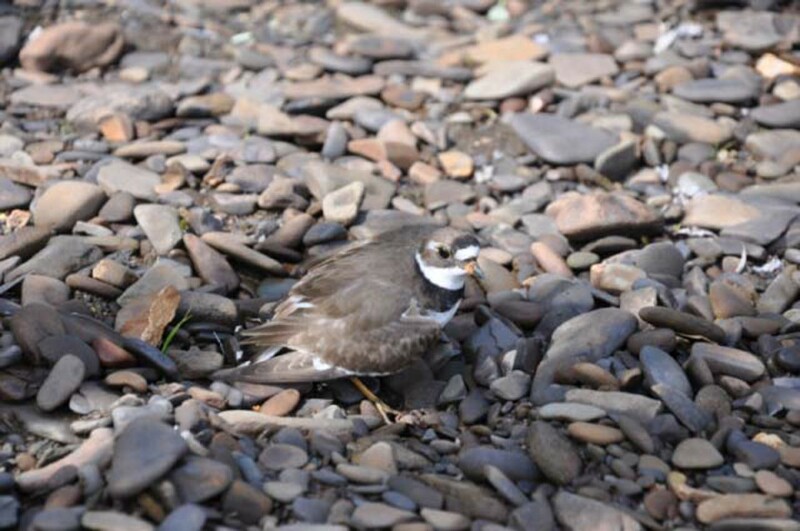 Some may not recover enough to out-migrate this year 100 miles to the salt but remain another year prior to returning to the estuary. The rich feed in the estuary is required to bulk up their fat reserves in order to spawn. 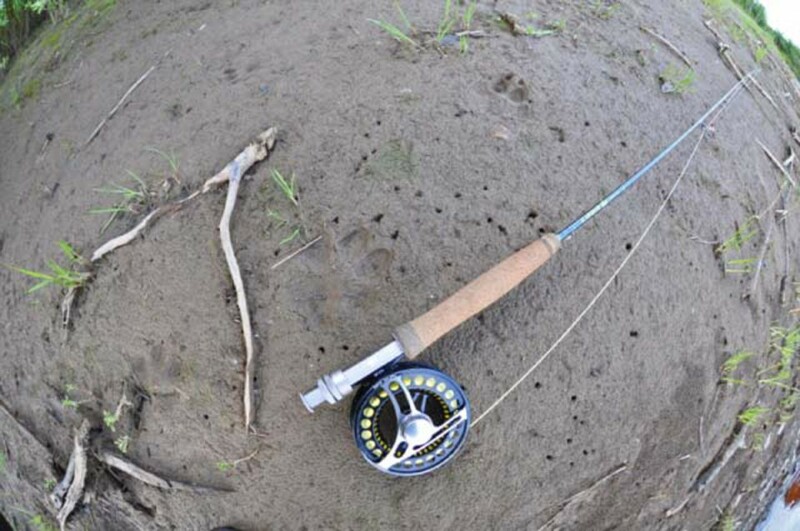 Back on the river We saw some tracks of a truly remarkable coastal Brown Bear. In this country each bar one fishes and camps on is host to many tracks and one catalogues them as to size and relative newness, but we go years between sightings of tracks that size. From the log of June 22, 2010. 24 hours of daylight and on the lower river near the confluence with the Nushagak are dreamy cumulous clouds. It is warm and we are nearly tempted to shed waders and wet wade. The fishing was stunning all day and Robert caught about 15 Rainbow trout, six of which were very large, and many, many grayling. 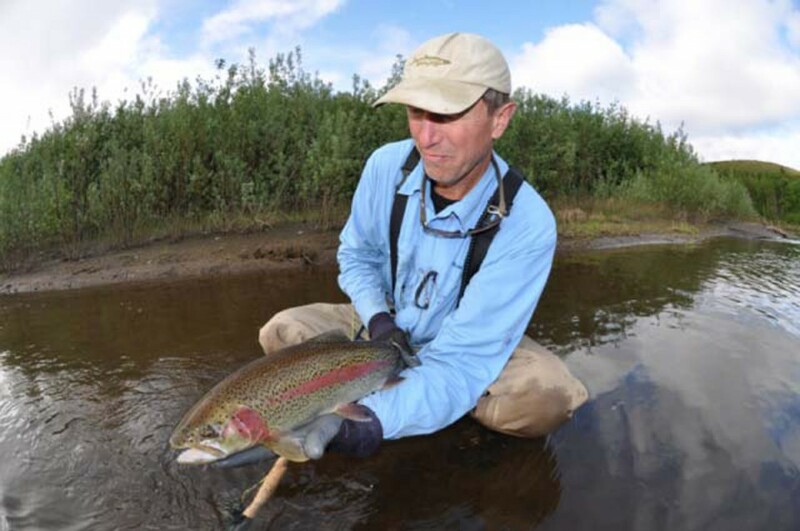 The rainbows of this size don’t leap quite so spectacularly as the 18-20 inch fish but when they porpoise on a run toward a log jam they leave you feeling a little desperate, thinking about your tippet and where in the mouth the hook might be lodged. Upon the release of one old growth trout there came a bizarre sound from above like newsprint being torn and right over our shoulders a bald eagle dove down on the old trout. 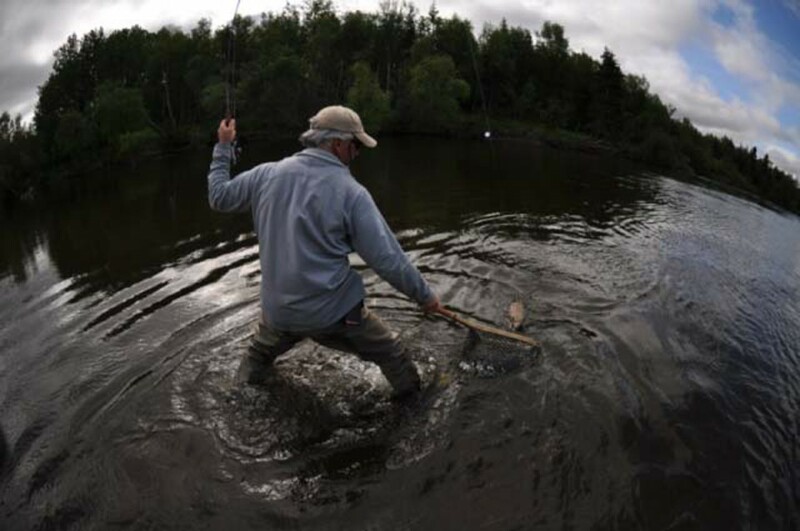 The trout was just a bit too deep and the eagle collected itself and managed an awkward wet exit without the fish. There was no better object lesson in why these trout living nervously in a clear water stream adopt heavy cover as preferred habitat. 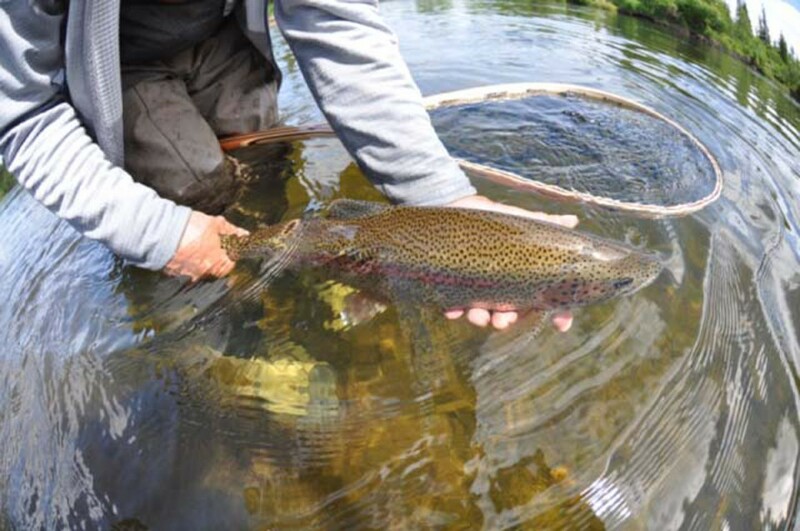 For a Rainbow Trout to get to the size of these fish they must remain in cover to avoid aerial predation except when special food sources like salmon spawn make it worth the risk of exposure. 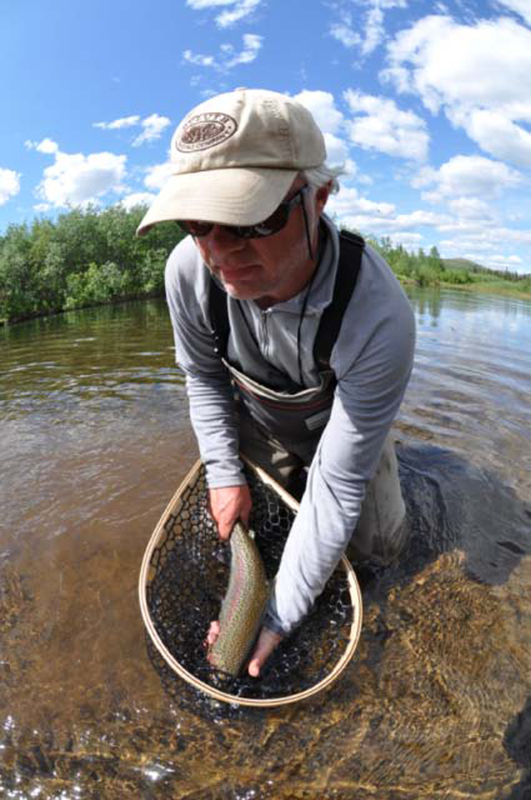 However even in the spawn one catches the rainbow near cover whereas the char will be in the open. From images of leopard trout one sees why the leopard spotting pigment is a perfectly evolved defense from aerial predation. Asked if the week was well spent, meaning was the fishing great, meaning did we catch a lot of Rainbow trout? How would one reply? 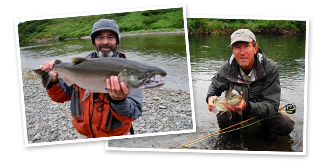 In truth the fishing was quite hard; none of the trout were “gimmes” they were pulled out of terrible cover. Not a single rainbow all week was seen before the hook was set, never a rise to cast to, nor a boil. Too early by a full month for the egg feasting which can make it seem easy? But Robert and I touched some beautiful fish under the wildest conditions. So the long answer is that we will be back.